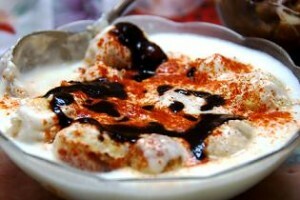 Dahi Baras recipe by Dahi Baraa'S at DesiRecipes.com. Blend the dal , salt , red chilly powder, baking powder and a little water in a blender to make a smooth paste. Put the mixture in a bowl and add the cummin seeds. Mix well with a big spoon. Heat the oil. Put 1 heaped tablespoon of the batter into the hot oil and fry over medium heat till it is brown. Finish all the batter in this way and set aside. Now fill a bowl with water, add to it 1 tsp. salt , cummin powder and red chilly powder. Put the fried "baras"in this water. Then beat the yoghurt with sugar, salt and 1/4 cup water to a smooth consistency. Remove the "baras"from the water, pressing them between your palms to squeeeze out the water. Set them in a dish. Pour the yoghurt over them. Spoon a little of the tamarind chutney on top and sprinkle same chaat masala. ENJOY!!! !